In the figure, points are given in two rows. Join the points AM, HE, TO, RUN, IF. 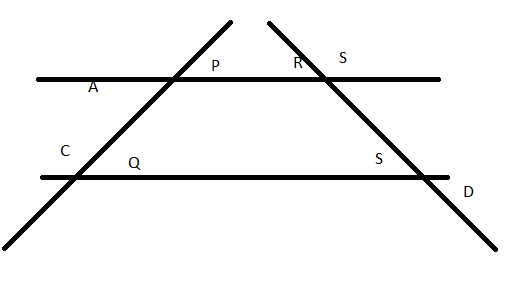 How many line segments are formed? i) Yes, we can draw line segments on the face of the cuboids. iii) Yes, we can draw line segments on the curved surface of a cylinder. Every line segment parallel to the axis of a cylinder on the curved surface will be a line segment. iv) Yes we can draw line segments on the curved surface of the cone. Every line segment joining the vertex of a cone and any point on the circumference of the cone will be a line segment. v) Yes , we can draw line segments on the base of the cone. Yes, , we can draw line segments on the curved surface area of the cone. Every line segment joining the vertex of a cone and any point on the circumference of the cone will form a line segment. In the figure name all the rays with initial points as A, B, C respectively. i) Is ray AB different from AC? ii) Is ray BA different from CA? iii) Is ray CP different from ray CQ? Yes, because both the rays. CP and CQ are different. iii) Metal outline of a sliding glass door.